t's one thing to know that you're attending what has quickly grown into the largest annual high-end show in the United States. It's something else entirely to try to take in even a third of the 180 exhibits that were spread over the width, breadth and height of the Denver Marriott Tech Center. Show exhibits extended to eight packed floors, and down into the. . . When I reported in our report from the 2009 RMAF that I perceived a degradation when Ted Denney of cable manufacturer Synergistic Research removed his tiny ART devices from the room, it triggered a debate that raged not just in the comments following that report but also in our website forum right up to today. The fact is that these small metal bowls are too small to have a significant effect on the acoustics of a room at frequencies below 10kHz or so, yet they seem to improve the accuracy and stability of stereo imaging and even tighten up the sounds of bass instruments. It is a mystery, therefore, how these devices can work. I have conjectured that perhaps they have an effect on the listener’s state of mind rather than the acoustics, but if so, then I don’t comprehend how that effect can be both repeatable and demonstrable. 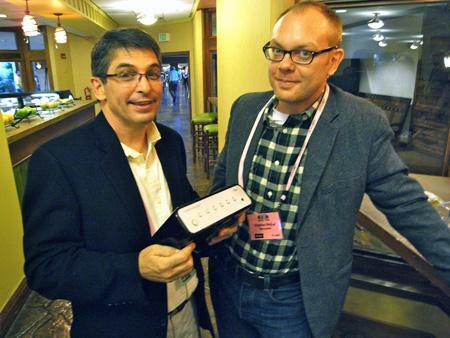 Whatever they doif they do anything, that istherefore, I wasn’t sure what to expect when I went into my final room at the 2010 RMAF, the Synergistic room. Jeffrey Catalano’s High Water Sound provided my very favorite musical experience of the 2010 Rocky Mountain Audio Fest. Along one wall of the room, there were stacks and stacks of vinyl records, an obvious sign of something good about to happen. Some of my happiest sonic experiences at RMAF arrived in the last two rooms I visited: the Tidal Audio/Argento Audio Cables/dCS showcase put together by Doug White of The Voice That Is (Newton Square, PA), and the Simon Yorke/CAT/Synergistic/Lansche exhibit assembled by Tim Nguyen of Tone of Music (San Francisco, CA). 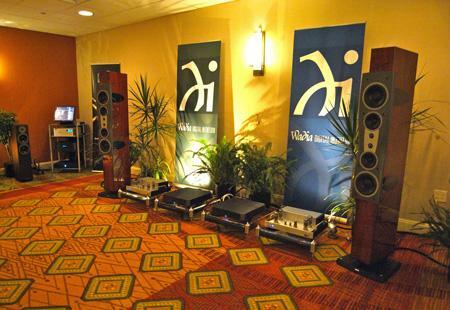 Perhaps the best sound I heard at RMAF was in the large room on the mezzanine shared by Dynaudio, XLO, and Wadia. The Dynaudio Confidence C4s ($20,900/pair), which I first reviewed in March 2003, were sounding as good as I remember them sounding in my own room, perhaps even better. The rest of the system was obviously high-class: a Wadia 971 CD transport ($17,950) fed Wadia's Series 9 Decoding computer ($33,450, comprising the 931 controller and dual-mono 922 DACs), which in turn fed Octave MRE130 tubed monoblocks from Germany ($16,000/pair) sitting on Grand Prix amp stands. Cabling was all by XLO. The 130W Octave amplifiers use two pairs of KT88s in push-pull and the wideband output transformer has a single tap. The amp can also use 6550s or EL34s, and an accessory "black box" increases the B+ storage capacity. 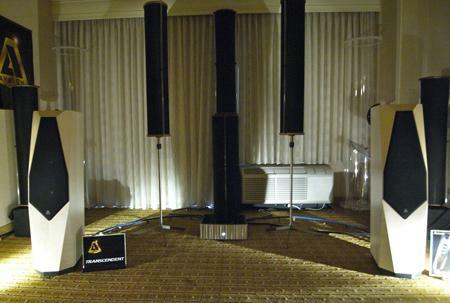 One of my two best sounds at RMAF was from Revel's Ultima Salon2 speakers ($22,000/pair), which have been favorites of mine since Larry Greenhill's review appeared in the June 2008 issue of Stereophile. 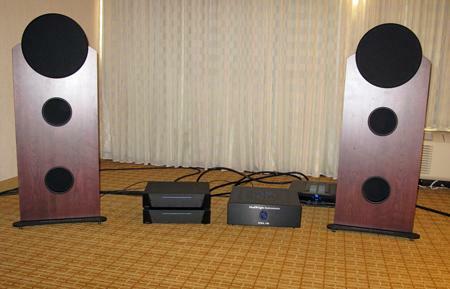 At RMAF, the Revels were being driven by Mark Levinson No.53 monoblocks ($25,000/pair), which in turn were being fed straight from the variable output of a Mark Levinson No.512 SACD player ($15,000). Cabling was all-Transparent. The superbly stable soundstaging extended beyond the physical positions of the speakers, the tonal balance was one of the most neutral I heard at the Show, and the bass was both extended and defined. I would have stayed listening for longer, but the Show only had 30 minutes more to run and I had two more rooms to visit. DIY hi-fi used to be an important aspect of audio magazine content 30 and more years ago, but these days it has migrated almost completely to the Internet, with just Ed Dell's AudioXpress magazine still waving the roll-your-own flag in print. 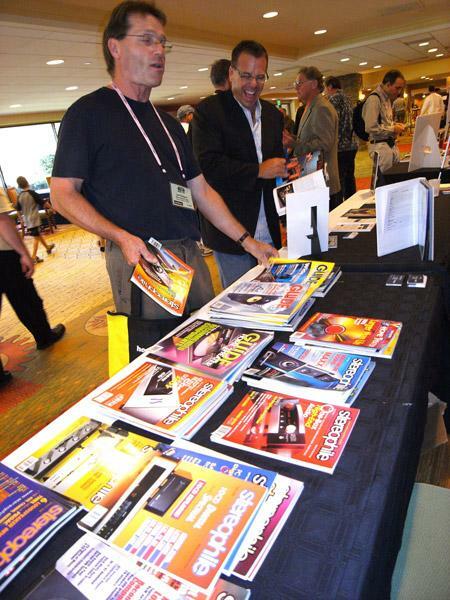 Sharing a stand at RMAF were two of the Internet's most notable DIY engineers, Jan Didden from Holland (left) and Bob Cordell from New Jersey (right), and both were venturing into the print medium. 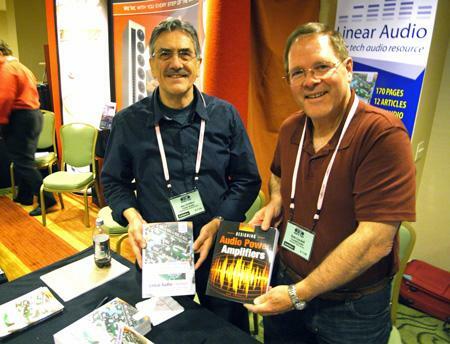 Bob had advance copies of his new tome Designing Audio Power Amplifiers for sale, which I will be reviewing in Stereophile early in the New Year. Jan had the first volume of his new bookzine Linear Audio, which has articles on audio design from Bob, as well as Doug Self, Joachim Gerhardt, Nelson Pass, Siegfried Linkwitz, and many others. But if you have any interest at all in the nuts and bolts of audio design, don't wait for my reviews of these books; check them out for yourself. 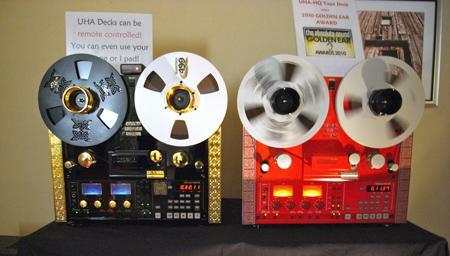 There's audiophile gold within their pages! Peachtree's David Solomon, seen here accosting Stereophile's Stephen Mejias (right) in the hotel's coffee bar, was in ebullient mode. He's holding Peachtree Audio's new idAC ($999), which combines the usual 24/192kHz S/PDIF inputs with a 24/96-capable USB input and an iPod dock that, like the Peachtree iDecco amplifier that is favorably reviewed by Art Dudley in our December 2010 issue, takes the audio data from the iPod in digital form. The iDAC uses the latest version of ESS's 32-bit Sabre32 D/A chip. 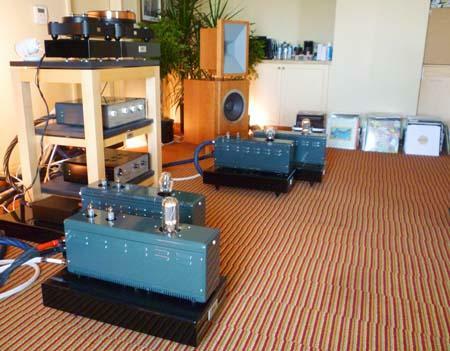 Due to all the positive reviews Emerald Physics loudspeakers have earned, it took several attempts over a three-day span until the crowds in the two Emerald Physics rooms had thinned down enough to allow a brief listen. Oswalds Mill Audio is doing something refreshing and beautiful, combining brilliant industrial design with a classic sense of style and a deep love for music. Boulder-based retailer Blu Note Design had a passive display in the Marriott's loby, but its active room on the second floor of the Tower was debuting the Avalon Transcendent speaker ($15,000/pair). 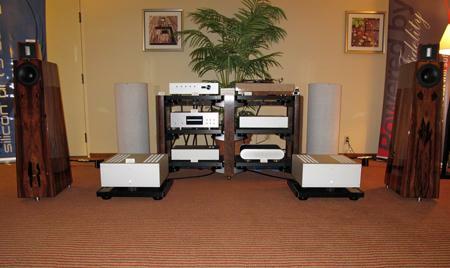 One of my best sounds at the Show, the 2-way, 3-driver speakers were being driven by a Jeff Rowland Design Group 625 amplifier, a Jeff Rowland Corus preamp, an Ayre C-5XEmp disc player and QB-9 DAC, with Cardas Clear cabling. 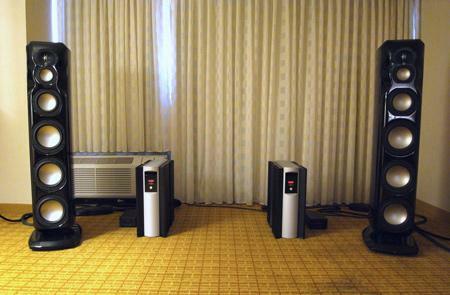 New York-based Nola was showing its Metro Grand Reference speakers at RMAF ($25,000/pair). Combining a Raven ribbon tweeter and a 4" midrange, both mounted on an open baffle, with two 6.5" reflex-loaded woofers, this slim tower, driven by an Audio Research Reference 210 power amplfier, Reference 5 preamplifier, and CD8 CD player via Nordost cabling, produced more bass than I thought possible, given its modest drive-unit array. The response is specified as being 6dB down at a low 26Hz. 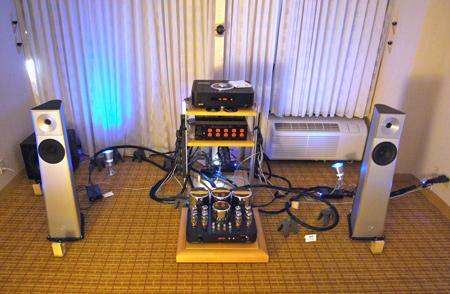 This was one of several systems at RMAF using the Quantum QX4 AC treatment device from Nordost. Source material in the Nola room was a pair of open-reel recorders from United Home Audio, but on the one piece I listened to, Mussorgsky's Pictures at an Exhibition, it sounded like a dub from LP. Not that there's anything wrong with that! 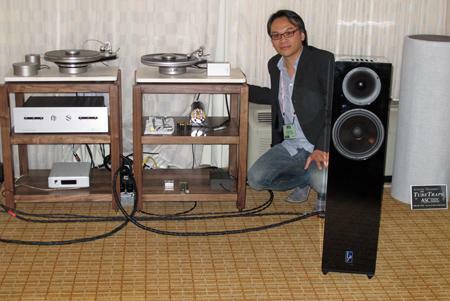 I was smitten by the sound of San Francisco-based dealer and distributor Tim Nguyen's Tone of Music equipment line-up at the California Audio Show. 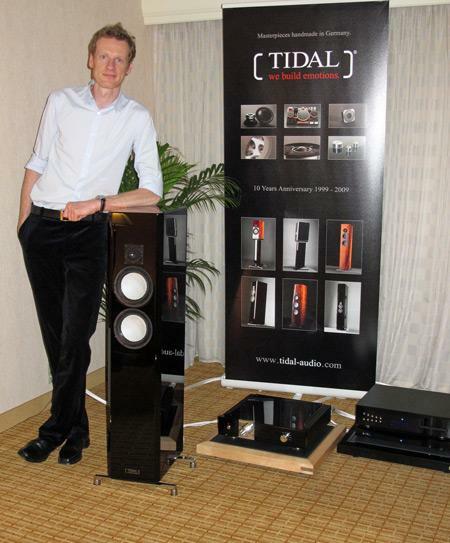 Tim's RMAF exhibit, which featured the Simon Yorke turntables he distributes, included the Simon Yorke S10 Record Player ($19,950), Convergent Audio Technology preamplifier ($9950) and Jl2 signature amp ($19,950), and Synergistic Research cabling. The big difference was the presence of the Lansche No.3 loudspeaker from Aaudio Imports ($30,000/pair in gloss black), a 2-way with 91dB sensitivity and frequency response of 40Hz150Hz (!) ±3dB. 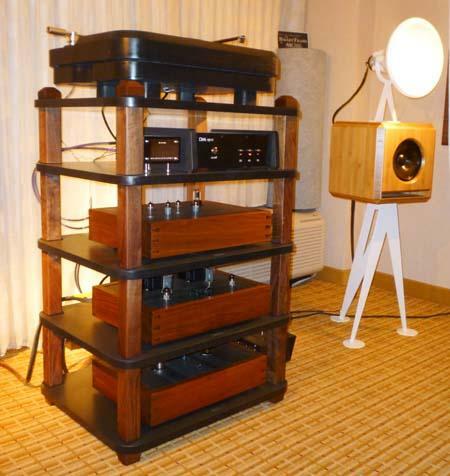 Elsewhere in this blog, Stephen Mejias enthuses about the Kaiser Kawero loudspeakers ($66,000/pair). 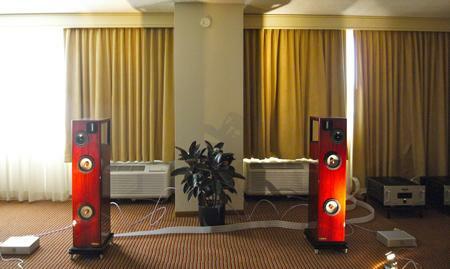 I first encountered these loudspeakers at RMAF 2008's Kaiser/Echole exhibit extension in the nearby Hyatt, and have coveted them ever since. Optimally paired and internally wired then and now with Echole's excellent cabling, as well as with modded tube amps that had been re-wired with Echole, the sound of this system was so large, rich, and true that it blew me away. Stephen's summation"This system, more than any other I heard at RMAF, seemed to bring the musicians and instruments into the room with really impressive body and force"rings true.